All day Thursday, Bennett struggled. He didn't really feel that great, certainly not as well as he had the day before. He whined a lot and seemed particularly needy. This went on all day from Bennett. Some moments he was playful and content. Other moments he was irritable and calling out in pain. The only relief we could get was by venting his g-tube. In addition, I noticed that all day there was almost no poop or gas coming out of his ostomy. Air could exit through his g-tube but there was no output from the ostomy. He had belly pain, despite being given pain meds. By evening, I decided to call the on call ostomy nurse at the hospital. Maybe his output was normal for someone his age with an ostomy? I explained Bennett's symptoms. She reached out to his surgeon who suggested we come back in to the hospital. The surgeon was concerned Bennett might have a bowel obstruction. Brian and I waffled back and forth on whether to drive the 2 hours to Dallas at 8:30PM to be admitted through the ER. But, ultimately, we decided to take him in, especially when we noticed he also seemed to have a slight fever, even on pain meds. Brian volunteered to take Bennett since he had had the most sleep between the two of us. When Bennett heard he'd be going back in, he turned into his pillow and cried: "I don't want to go back to the hospital! I'm ok. I will go to sleep!" It was really hard to hear him protests...but we knew it was best. 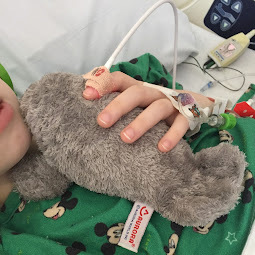 Bennett finally finds some brief comfort in the ER, while holding the syringe that vents his g-tube from gas pain. 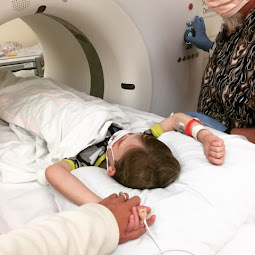 After spending literally all night in the ER at Children's in Dallas, Bennett was finally admitted at 8AM to the GI floor. 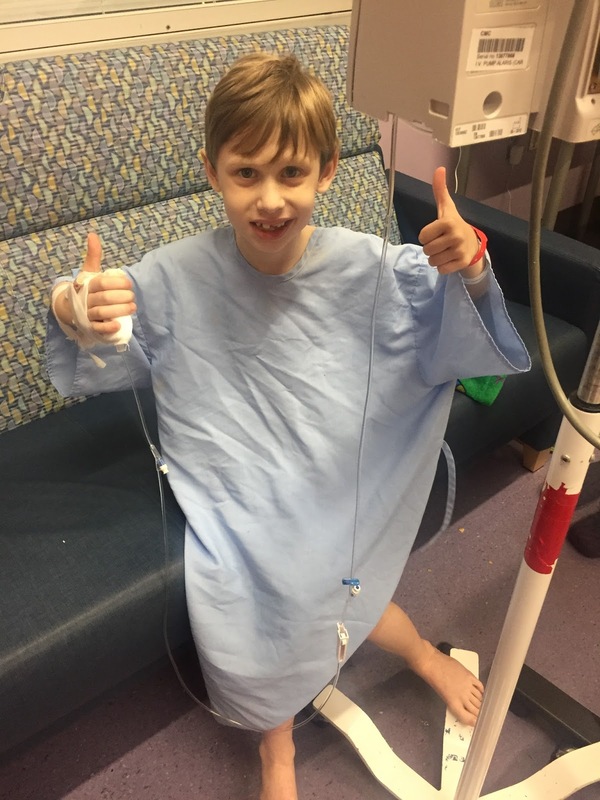 An x-ray Bennett showed he had another ileus, this time with stool buildup, so the decision was made to give him a clean out (or at least several enemas) to see if they could prevent a bowel obstruction. A urine analysis also showed Bennet had a small amount of blood and some white blood cells in his urine. Back at home, I sent Oliver and Avonlea to school so I could pack and get ready to go back up to Children's for the next few days. Brian kept me updated throughout the day about Bennett's condition and what the doctors were thinking about his his presenting symptoms. It seemed that most of the day nobody had a very good grasp on what was going on with Bennett. At one point, I spoke with Bennett via Facetime. I was surprised by how much pain he still seemed to be in. He had gone with his dad to the hospital more than 12 hours before and still he was very very uncomfortable. Around 2pm, I learned via a text from Brian that Bennett was going in for a sonogram for a potential blood clot in his leg due to complaints of pain. Bennett had originally complained of foot pain while we were in the hospital last week. But this symptom seemed to go away once we got home. This time, however, pain in his foot was back with a vengeance and now included leg pain that no amount of pain medicine was helping. After I picked up Oliver and Avonlea from school, I headed straight to Dallas to take over for Brian. Brian's texts continued to be worrisome. Bennett was still not feeling well. And Brian, having had no sleep in the ER the night before, was becoming more and more overwhelmed by an inability to provide Bennett comfort. 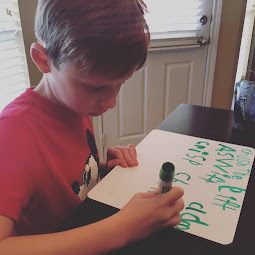 While driving to Dallas to the hospital with two children in tow, I realized that the transition of care for Bennett from Brian to me, with Bennett screaming in pain the background, might not be a good idea with the other children. His screams would likely would alarm Oliver and Avonlea causing even more chaos. I knew if I could talk to Brian for just a few minutes, then I could take over Bennett's care and relieve Brian to take Oliver and Avonlea and go rest. So many wonderful people have reached out to me to help in whatever way we need. When I realized my need for someone to care for the children for just a few minutes once I got to the hospital, I decided text one of those people who offered to help as she lived very close to the hospital. 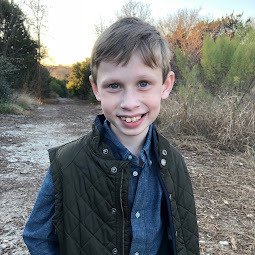 I asked Amy, the Executive Director of the Cystic Fibrosis Foundation in Dallas, if she would meet me at the hospital in 40 minutes to watch Oliver and Avonlea, just long enough so Brian and I could have a conversation about Bennett's care. Amy was amazing. She jumped in her car, met us at the hospital and took care of the kids just as I needed - long enough for me to get my bearings. Upon arriving at the hospital and seeing Brian and Bennett, I could tell they both were exhausted. Brian had done a wonderful job taking care of Bennett all day and night. He had tried everything...but Bennett continued to cry out with no relief. The first thing I did was check in with the nurses on what Bennett was being given for pain. The plan seemed reasonable, considering we were trying to offer Bennett non-narcotic pain relief. I tried to calm Bennett down. But the only thing that seemed to help was if Brian or I would massage his right leg and foot at the same time. Bennett's muscles seemed really tight. He also complained how sore his back was. To me, the pain looked like it was coming from uncontrolled muscle spasms. The fact that it could be calmed with deep pressure massage made me wonder if he wasn't having "charlie horses" all over his leg. I asked for a muscle relaxer for him. 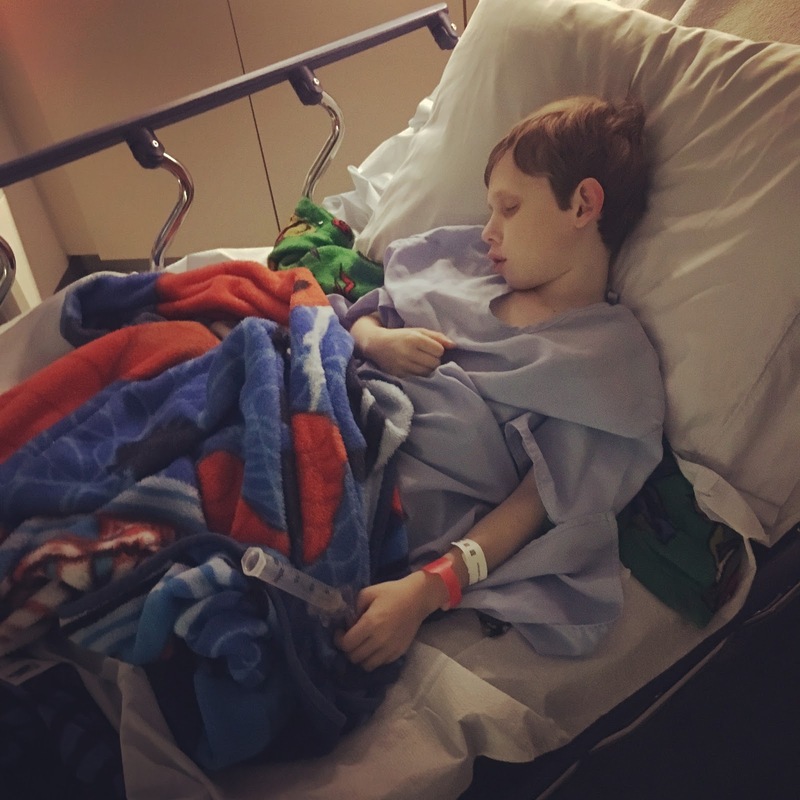 The doctor said she didn't want to do anything until they received the report back from the sonographer, just in case Bennett had a blood clot in his leg (a possibility since he had just had surgery). I asked for the muscle relaxer in the meantime but the doctor was very hesitant. She did, however, agree to a stronger non-narcotic pain med of IV Ibuprofen. While that may have helped come, any true relief he got came from Brian and my massaging Bennett's food and leg - for over an hour straight. Bennett would start to fall asleep for 10-15 minutes but then he would wake up whining he was uncomfortable. While the doctor waited for the sonographer's report on the blood clot, the nurse came in to do his enema. I explained that I didn't want to do anything more to him until we had addressed his leg pain. The nurse was willing to comply with my wishes but also mentioned that Bennett hadn't peed since 11pm the night before and would do well to pee. She asked if I would take him to the potty. Blood had been detected in Bennett's urine, as well as white blood cells. But the doctor didn't want to assume Bennett had a urinary tract infection (UTI) until the urine culture results came back. I explained to the nurse that I would be happy to have Bennett go pee but not until we relieved the leg pain. Eventually the doctor reemerged to report the sonographer found no clot. She finally agreed to try to the muscle relaxer. Within 30 minutes or so, Bennett seemed comfortable enough for me to ask him to get up and pee. He cried on his way to the bathroom. And then screamed bloody murder when he peed (10 out of 10 on the pain scale is how he described it later). He seemed peaceful in a way I had yet to see have seen him feel since before his surgery. He sat there on the potty trying to go pee more, even though it was clear his bladder was empty. I couldn't believe how much calmer he felt. Burning while peeing, feeling an urge to pee even when the bladder is empty...those both sounded like UTI symptoms to me. Add to it the fact that he had a low grade fever and we knew blood had been detected in his urine, as well as white blood cells. I asked to speak with the doctor about the fact that I believed Bennett had a UTI. She was hesitant at first but I began explaining to her my reasons for while I thought Bennett had a UTI. She said, "I know they were waiting for the culture results first." I said, "yes, but those might take days and he needs to be treated now." She pulled up the urine analysis report and agreed the test results, while not a conclusive culture, seemed consistent with a UTI. I showed her a video I had taken of Bennett in agony only 2.5 hours before and then showed her how different he looked now that he had peed and been given a muscle relaxer. At this point, he was walking, talking, standing up straight, smiling, even playing. She agreed that there was no benefit to waiting and that the evidence looked like a UTI was the culprit. She ordered him to be given antibiotics asap. By this point, Brian had already gone with the children to my sister's house for the night. So, I sent a video to Brian of Bennett in his current form. Brian was shocked. Brian responded via text to my video of Bennett feeling so good: "Are you telling me I listened to him writhe in pain all day and it was just a muscle relaxer?" I explained that the combination of muscle relaxers and his emptying his bladder is what seemed to give him relief. The reason he didn't pee for over 9 hours is likely due to his fear of pain when he peed. But that was likely only exacerbating the problem. And the reason for the ileus/slow bowel? An untreated UTI. Many times, if the body is fighting an infection, it will slow the gut. So, while the three enemas and cupful of miralax we gave him was helpful, they were likely just treating the symptoms of an untreated UTI. And the UTI is likely due to the bladder catheter Bennett was given in surgery and had to keep for days. Last night before bed, Bennett was given his first antibiotic to treat his UTI. At this point, he is staying on muscle relaxers and continues to feel tremendously better. He had a very peaceful night and has slept all morning. They started him again on solid food this morning. We will see how he feels throughout the day.